Municipalities dedicated to waste reduction and environmental sustainability through their own operations are in a much better position to educate and encourage their residents and businesses to practice the 3Rs everyday. 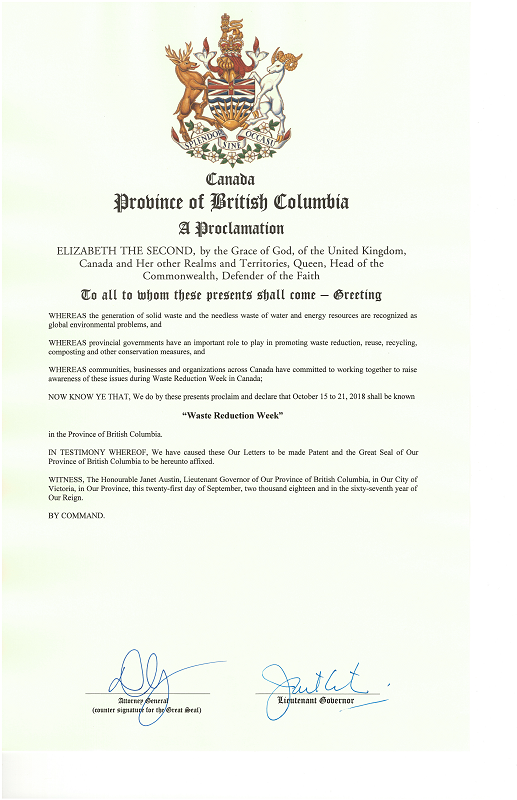 Lead your community by example by officially proclaiming Waste Reduction Week! Show your support by registering your local waste reduction event! Waste Reduction Week in Canada's Municipal Resource Kit is a great starting point for any local government officer, educator or decision-maker who wants their community to reduce the amount of waste they are producing as well as providing employees themselves with valuable information. You can also find other resources for municipalities on the Waste Reduction Week in Canada website. Thank you to the following municipalities and governments for officially proclaiming Waste Reduction Week 2018!